A large fraction of the population above the age of forty experiences a loss of vision due to cataract. vision. Cataract, if detected early, can be surgically removed and vision can be restored. this is done, an intraocular lens implant is placed within the lens membrane to restore vision. Despite being a common procedure, cataract surgery involves a lot of precision work. Intraocular lens implants were developed over ten years ago. Prior to the introduction of lens implants, patients had to wear strong glasses or contact lenses after the cataract surgery since the natural lens of the eye had to be removed, thus impairing vision. Intraocular lens implants changed the game for good. What is the advantage of a foldable IOL? Over the years, intraocular lens implants have taken many forms and one of the latest is a foldable silicone lens implant. 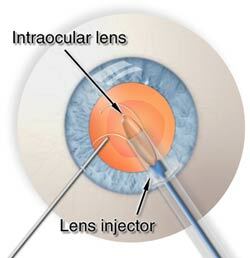 One of the biggest concerns when it comes to laser cataract surgery is the incision that is to be made in the eye. For years, surgeons have been researching ways to make this incision as small as possible in order to avoid post-operative complications. Large incisions were required for the removal of the natural lens and the implantation of the new lens. Implantation was especially difficult since most implants are not flexible and have to be inserted without compromising the structure of the implant. Foldable lens implants have been quite a revolution. These implants can be inserted through smaller incisions. The incision is typically only an eighth of an inch, meaning that there is no need for sutures and since the incision is quite small, it self-heals. The foldable silicone implants are flexible and can be easily maneuvered into the eye without much complication. The cataract is broken into smaller pieces and then vacuumed through the incision, following which the lens is implanted. These silicone lens implants can be used to correct astigmatism and short-sight in patients who have undergone cataract surgery.